Our map shows the top VC investing in tech companies in each state, from Andreessen Horowitz in California to Lerer Hippeau in New York. Although startups based in California, New York, and Massachusetts have traditionally accounted for the majority of VC tech investment in the US, VCs are spurring other hotbeds of innovation across the country. 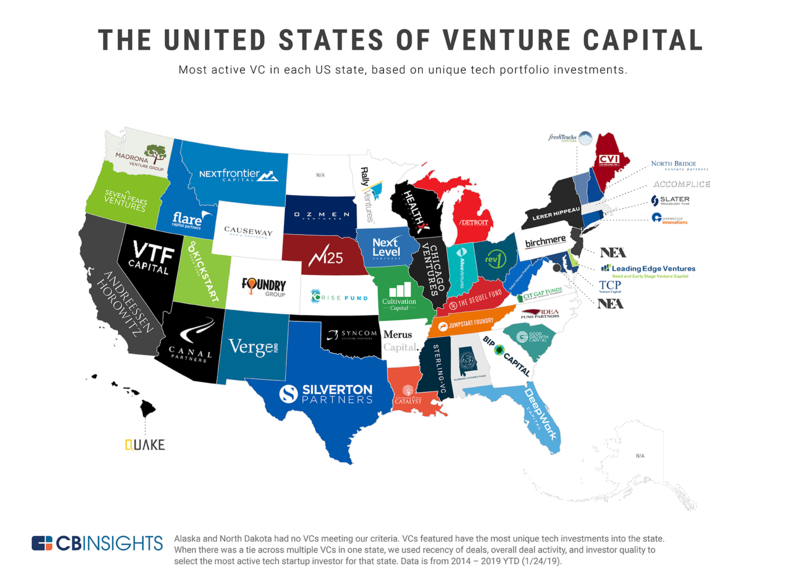 Using CB Insights data, we analyzed the most active venture capital firm in each state, based on unique tech investments from 2014 to 2019 YTD (1/24/19). Get a free excel file and see the top VCs investing in every state, where investors are located, and which VCs have a home court advantage. We excluded debt deals and only considered venture capital, corporate venture capital, super angel, and growth equity firms. In the case of a tie, we used recency of deals, overall deal activity, and investor quality to select the most active tech startup investor for that state. The full list of VCs featured is included at the end of this post. Three of our Smart Money VCs — top VCs according to portfolio valuations and investment outcomes — made their mark on the map: Andreessen Horowitz (California), Foundry Group (Colorado), and New Enterprise Associates (DC, New Jersey). NEA was the only investor to take the top slot in more than one state, leading in DC and New Jersey investments. There have been a number of shake-ups since we last conducted this analysis in May 2017, with 21 changes in top investor. Chicago Ventures overtook Pritzker Group Venture Capital in Illinois, and NEA replaced Fortify Ventures in DC. Meanwhile Smart Money VC Bessemer Partners was booted off the map, edged out by Quake Capital in Hawaii. Investors like Andreessen Horowitz (California), Lerer Hippeau Ventures (New York), and Accomplice (Massachusetts) held their ground in these VC hotspots.